Design process led us to this amazing history. In our next poster, we are going to choose verses of the Quran about nature and God’s creation. The basic Idea was to use Ancient illustration styles from the people who had the deepest relations with nature. 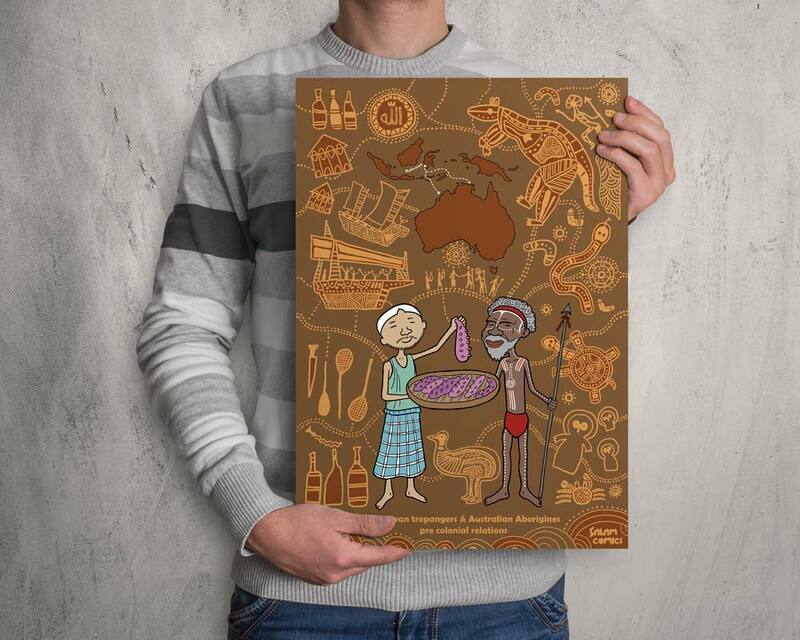 One of the cultures that we studied for this reason was the Australian indigenous beautiful culture and artworks. Their artwork is not just drawing animals and symbols is holds great significance through indigenous History, Tribes and their personal life, every artist has a story to tell and every tribe has certain rules as to what type of art they can do. Not everyone has the right to learn or practice the art, it is sacred. As we contacted some indigenous people we realized that using their artworks and claiming them as an aboriginal artwork is offensive to the tribes elders as a result our first decision was to not use a close style to their artworks in our Quran educational posters and try to use some other ancient art styles with a few inspirations from aboriginal style to avoid any disrespect. 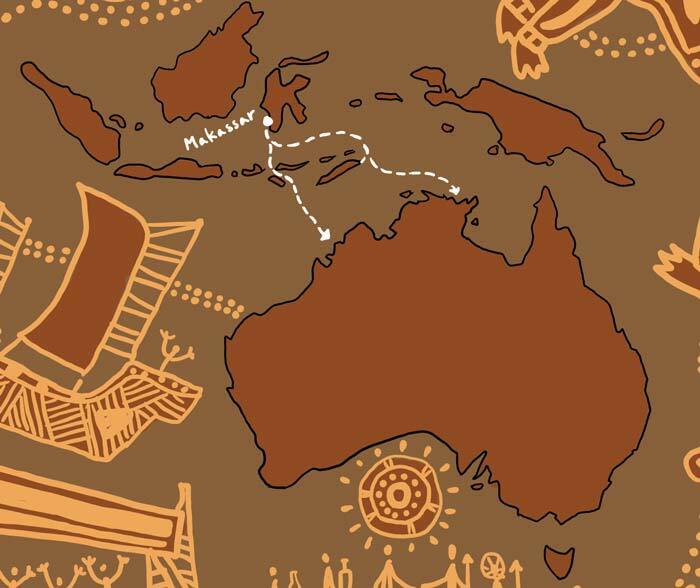 Dating as far as the early 1700s (Some historians say that it was much earlier according to radiocarbon tests), the Aboriginal and Torres Strait Islander people had regular contact with Makassan Muslims(an Indonesian Muslim tribe). the traditional Indonesian boats known as praus brought Makassans to Australia in search of trepang(sea slugs) to trade the to China as a high price medicine. 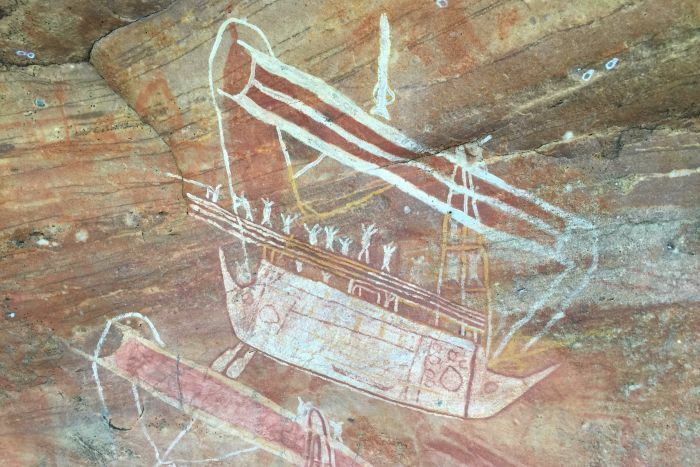 These boats can be seen in the cave painting found in the north of Australia. 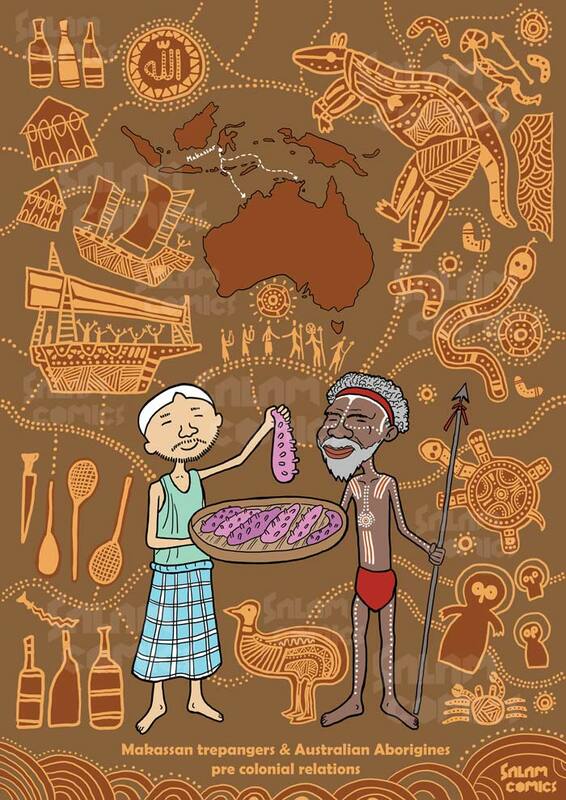 The Makassan-aborigines relations where completely peaceful and full of respect. “They traded together. it was fair – there was no racial judgment, no race policy .” Quoted by John Bradly an anthropologist from Melbourne Monash University. These relations caused many cultural influences on both sides. If you go to north-east Arnhem land a trace of Islam is obvious in their songs, paintings, and funeral rituals. Linguistic analysis proves that you’re hearing hymns to Allah. The Makassans were the first Muslims who had relations with Aborigines but not the last groups. At the colonial era, Afghan cameleers arrived in Australia.Afghan cameleers built makeshift mosques throughout central Australia, and many intermarried with Aboriginal peoples. After the cameleers there where modern immigrants who continued this journey. The Qur’an states that Allah made human beings into different nations and tribes. These racial and cultural differences, far from being wrong, are a sign from God. One of our missions in Salamcomics is to create interfaith and diverse contents to spread this message. We have several concepts in our mind to create several children book illustrations and picture books both about aboriginal culture and Muslim-aboriginal intersects. Mainly about the tribes who live in Arnhem land located in Northeast of Australia. But for doing this project we need research and connections to the tribes to avoid any harm to these amazing people. Please share this post with anyone who can help in this project. Also, we have a link to the illustration for downloading a high-resolution version without a watermark.